1. You can select any chapters in DVD to rip. 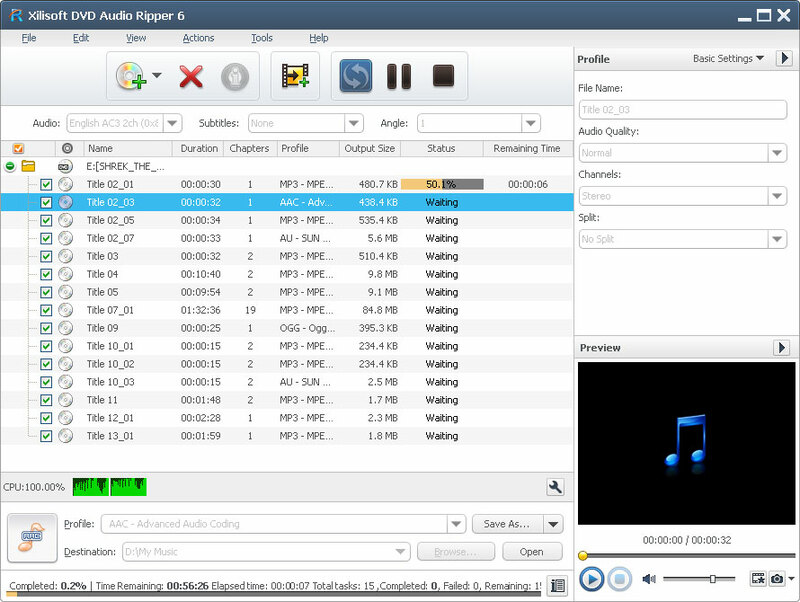 If you rename chapters, the DVD Audio Ripper will save audio files with those new names. 2. You can rip a clip by specifying beginning and ending time. 3. Choosing multiple profiles concurrently from one is supported. 4. Profiles are optimized for more convenient conversion. 5. Take snapshot when previewing. 6. Customize output file size with built-in Bitrate Calculator. 7. Check for updates automatically to ensure you enjoy all the latest functions. 8. You can edit ID3 tag for your DVD sound. 9. You can select a language or audio track when ripping multi-language DVDs. 10. Output audio quality is adjustable from 80 Kbits to 320 Kbits when ripping to MP3. 11. Support 5.1 channel surround sound system. 12. You may choose to retrieve DVD info from the internet automatically or manually. 13. Control the number of processed cores at any time during conversion. 14. CBR/VBR output format can be selected freely for certain profiles. 15. Easily control volume while previewing the DVD-video.